Jim T's Caddy: Kevin Welch - Riding in the Caddy Soon!! Kevin Welch - Riding in the Caddy Soon!! 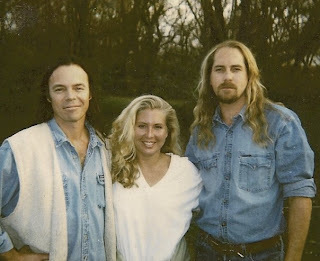 My wife (then hot girlfriend) knew Kevin Welch before I did. She took me to show and after he was finished mystifying the crowd he sat down and had a beer with us. I commented on a line in one of his songs that referenced a fishing knife and how I personally would like to be stabbed by that type of knife the least. That was the start of a long friendship. He was there when my first born showed up and he helped me put her right foot in some dirt from the ranch I grew up on in Texas. He has spent many a late night laughing hysterically as I shot him full of stories machine gun style due to my inability to stop talking while on the red wine. He's the God father of my kids but by God he can take a crowd and put them in a musical trance. His songs will take you on a journey and at the end you are a better person than you were when you walked in that venue's door. He is also an all around good guy. Look for an in depth interview from brother Kev in the coming weeks.